Maria Montessori believed in educating the whole child. 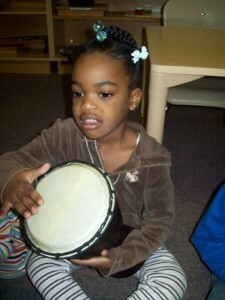 Music classes at Providence Montessori also seek to provide a holistic musical education. Class lessons are derived from the philosophies of two well-known pedagogues named Carl Orff and Emil Jaques-Dalcroze. Both men were contemporaries of Maria Montesori and as a result shared many of her educational ideals. The Orff and Dalroze methods seek to teach musical concepts such as rhythm, pitch, notation, phrasing, dynamics and more through body percussion or whole body movement in response to musical cues. The methods also employ solfege singing (do, re, mi. . . ) as a teaching device, which enables students to understand the building blocks of pitch and melody. These experiences lend meaning to otherwise abstract theoretical concepts and allow students not only to learn and perform musical works, but also to understand the musical subjects contained within them. 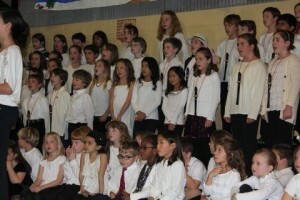 The result is that students learn new thinking patterns in addition to enhancing their musical performances. At Providence, students gain experience performing a variety of seasonally appropriate vocal works. Older students have the opportunity to play a variety of untuned percussion instruments, plus the beautiful Orff instruments, which range from bass xylophone to soprano glockenspiel. The instrumental experiences again allow students a direct application of their theoretical lessons in melody and harmony.